Build a scalable sales organization. As your sales team grows you need to make sure the sales processes you've designed can scale, and that the same level of attention is given to the right customers and leads. Zoho CRM's Blueprint helps ensure everyone in your team follows the right process, even when you're not looking. Introducing Blueprint. The easiest and most powerful way to build, sell, and repeat.? How does your sales team keep up with all the leads, prospects, and customers? How do they know what to do at each stage in the pipeline? That's why we've created Blueprint, a technology inside Zoho CRM that gently guides users through what actions should be taken at what time, and prompts them for the right information in the right sequence. Make your process repeatable for new hires, as well as longtime salespeople. Design your process visually with the Blueprint editor.? 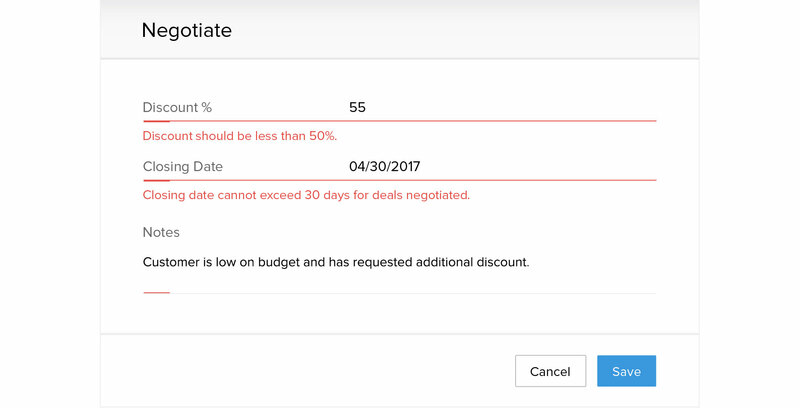 Drag and drop to connect your sales actions together. 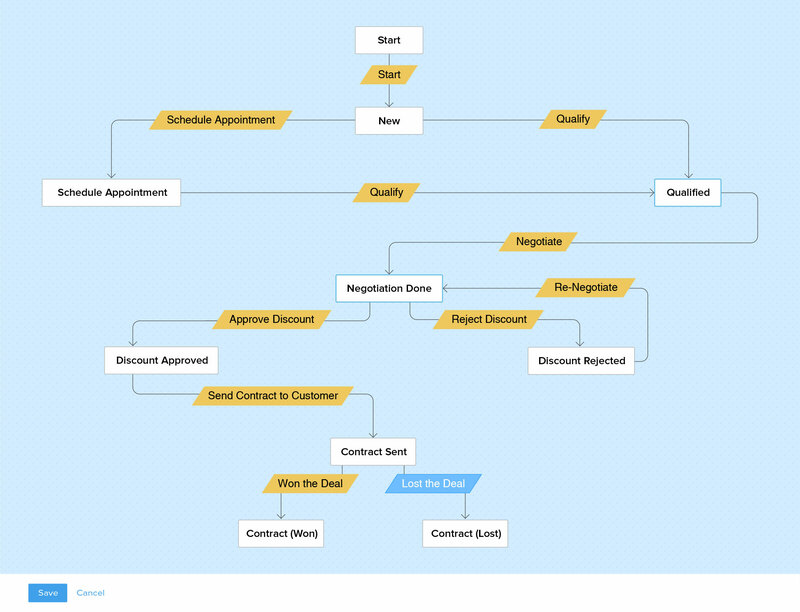 Specify the sequence in which you want your sales team to address each type of opportunity, decide on who can do what, and set conditions and actions that have to be met for a deal to close. Turn best practices into daily actions. Best practices remain good intentions unless they are put into action. Blueprint ensures everyone in your team follows the process just as you've designed it. 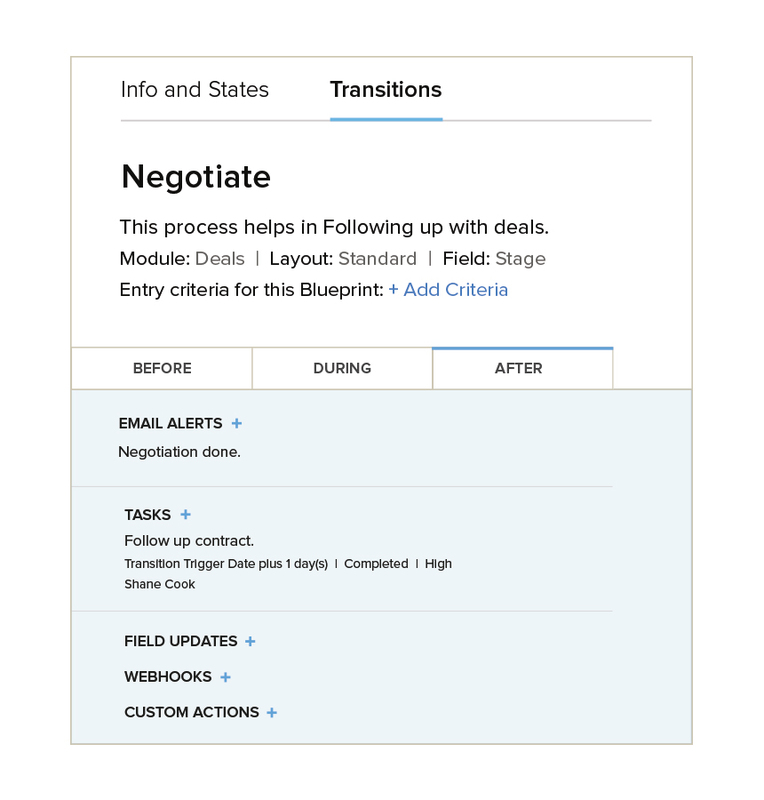 For example, when your team is in the process of closing a deal, Blueprint helps you ensure certain conditions, like fixing the maximum discount or negotiation period, are met. Ensure sales activities not only happen, but happen within the time period you've specified. The Blueprint feature of Zoho CRM has helped us immensely! As a FinTech-based financial planning company, one of our key problems was deciding what actions to take on a client, based on a complex set of underlying data parameters. We created a system where the Blueprint would advise us on what to do with clients—and this resulted in an exponential increase in our overall efficiency, and improved key metrics, like percent of engaged clients, weekly asset outflows, average daily clients, and advisor interaction times. We strongly recommend that retail businesses utilize the Blueprint feature of Zoho CRM. I've trialed over a dozen CRM software systems to find the right fit for my estate agency, and while many have appealing features, none come close to the customization possible with Zoho CRM. Though there are many reasons for this, much comes down to its Blueprint functionality. Blueprint lets me configure all of our workflow and other business processes so that literally nothing gets in the way of providing the best service to our customers. Zoho CRM's Blueprint has helped NavGurukul streamline multiple sales and marketing processes. Our training time has gone from 12 hours to an unbelievable 1.5 hours, while the volume of calls we can now handle has increased up to 3x. Sell on time, every time. Time waits for no one, not even when you're selling. ?By not letting a lead or deal stay in a particular stage for more than a specified time,?Blueprint in Zoho CRM makes sure your sales process keeps moving. ?Blueprint also?ensures that important tasks for a particular stage, like sending a quote or scheduling?the next follow-up call, are marked?complete before moving to the next stage of your process. Ensure your team works together to remove any bottleneck. Built-in reports help you uncover which part of your process needs the most revision. See where significant time is being spent by employees and where things have stalled. Let your system act for you. What's the use of a sales process if you can't execute it? From sending follow-up emails to maintaining customer records, there's lots of work to be done every time your sales team corresponds with a prospect. 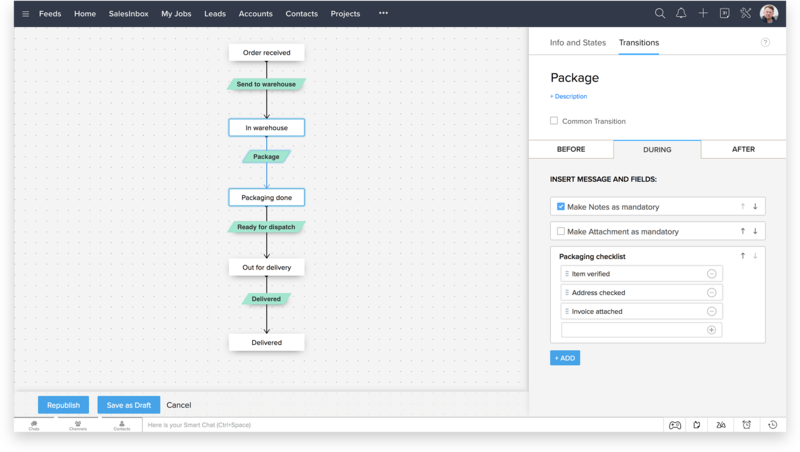 Configure actions for every stage of your process, and let Blueprint perform them automatically for you. ?